Acadian Genealogy Homepage; CD-ROM Review by Everton Publishers! The following is a brief review which appeared in the July 18, 1995 issue of "Everton's Genealogical Helper" (Volume 1, Number 10) by Everton Publishers (http://www.everton.com). 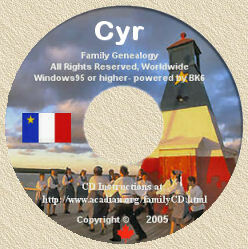 This Web site is THE source of information on a labour of love; the compilation of a CD-ROM with Acadian genealogies. The CD, titled "In Search of Our Acadian Roots", is featured, with information on the project, updates on the status of the work in progress, a look at the format (Tiny Tafels) of the data on the CD, a chronology of the work, and data samples. There is also an extensive list of links to other genealogy-related sites on the Internet, both general and specifically Acadian/French-Canadian sites.